In a medium bowl, combine salt, pepper, garlic powder, onion powder, cumin and ½ cup barbecue sauce. Add chicken, toss until completely coated. Transfer to a foil-lined baking sheet and bake for 35 minutes or until internal temperature reaches 165°. Slice thin and reserve. In a small bowl, combine corn, black beans and cilantro. Reserve. Place flatbreads on a baking sheet. Bake for 5 minutes. Spread remaining ½ cup barbecue sauce on flatbreads. 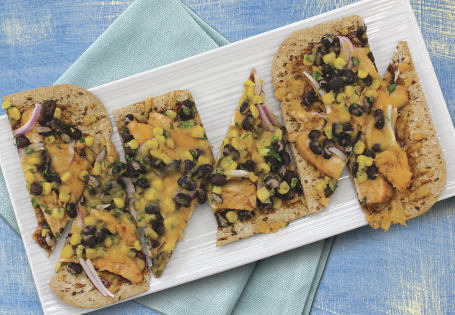 Place desired amount of chicken on each flatbread followed by black bean mixture, onion and cheese. Bake for 5 minutes or until golden brown. TIP: Bake chicken the night before to reduce total time.